Progress Platinum Prestige Credit Mastercard is a secured credit card for people on a low income who want to build a credit history. 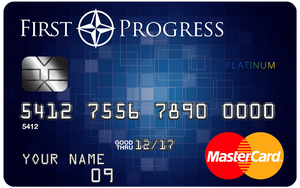 The Progress Credit is offered through Mastercard and is accepted worldwide. Once you have rebuilt your credit and applied for a non-secured credit card you can get your deposit back, it's that simple. Once you've established that you can make payments over a period of time you can apply for the First Access Credit Card from Progress. The annual percentage rate for purchases is 9.99%. The APR for cash advances is 18.99%. There is an annual fee of $49 dollars. Late payments and returned payments are up to $38 and $27 dollars respectively. If you wish to apply for this credit card please, find more details HERE.